Kundalini represents the cosmic vital energy lying dormant in the human body, coiled round the base of the spine, a little below the sexual organ, like a serpent, asleep. When roused, Kundalini rises through the sushumna, the hairlike duct rising through the spinal cord, like a streak of lightning carrying with her the vital energy of the body, to join her divine spouse Shiva in the last or the seventh center in the brain. 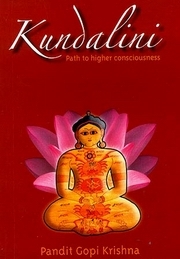 The Awakening of Kundalini is a perfectly natural biological phenomenon in any healthy human body' writes the author, 'leading towards a state of evolutionary perfection. Pandit Gopi Krishna (1907 - 1984) was not a guru in the classical sense. He was more a seeker who documented his experiences with Kundalini energy in the hope of understanding this unimaginably powerful force.